The Department of Justice Monday charged Maria Butina, a Russian citizen, with illegally acting as a secret Russian agent on U.S. soil. She was allegedly trying to set up a communications backchannel between the Russian government and U.S. politicians. Butina’s planned communication backchannel “could be used to penetrate the U.S. national decision-making apparatus to advance the agenda of the Russian federation,” the 17-page affidavit (pdf) says. 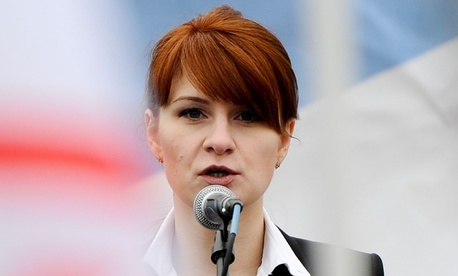 The document describes how Butina was directed by a senior Russian official and was in close contact with two U.S. citizens, as she arranged meetings and dinners with members of an unnamed gun rights organization—almost certainly the National Rifle Association. The description of the senior Russian official directing Butina closely matches the profile of Alexander Torshin, a Russian deputy Central Bank chief. Torshin, who has been sanctioned by the Treasury Department, is a lifetime NRA member and shared a table with Donald Trump Jr. at the organization’s 2016 convention. In November 2016, he tweeted that he and Butina were the only Russian lifetime NRA members that he knew. Butina prepared her operation with the advice of “United States person 1,” whom she met in Moscow around 2013. The aim for project “Diplomacy” was to build constructive relationships within an unnamed major US political party, which, she noted in a 2015 email to US person 1, has traditionally had a “negative and aggressive” stance towards Russia. In a March 2016 email in the affidavit, Butina suggests that the project had a green light from the Kremlin: “All we needed is <<yes>> from Putin’s side. The rest is easier,” she wrote. She went about developing relationships with top U.S. political figures by attending major events at the gun rights organization and organizing “friendship and dialogue dinners” in New York and Washington. Her operation appears to have worked; the affidavit quotes an October 2016 email from US person 1, telling an acquaintance that they had “been involved in securing a VERY private line of communication between the Kremlin and key [Republican] leaders” through the gun rights organization. The New York Times has previously reported that Butina tried to arrange two secret meetings between Trump and Putin during the 2016 campaign. According to the Daily Beast, Butina publicly and repeatedly claimed that she facilitated communications between the Trump campaign and Russia. In Sept. 2016 email, Butina wrote to the Americans that, “it’s the time for building an advisors team [sic] on Russia for a new president.” She said she wanted to “prevent” the next president from picking advisors who would be unfriendly to Russia.